A seminal figure in post-World War II literature, Charles Olson (1910-1970) has helped define the postmodern sensibility. His poetry is marked by an almost limitless range of interest and extraordinary depth of feeling. Olson's themes are among the largest conceivable: empowering love, political responsibility, historical discovery and cultural reckoning, the wisdom of dreams and the transformation of consciousness—all carried in a voice both intimate and grand, American and timeless, impassioned and coolly demanding. 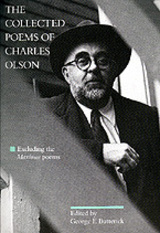 Until recently, Olson's reputation as a major figure in American literature has rested primarily on his theoretical writings and his epic work, the Maximus Poems. With The Collected Poems an even more impressive Olson emerges. This volume brings together all of Olson's work and extends the poetic accomplishment that influenced a generation. Charles Olson was praised by his contemporaries and emulated by his successors. He was declared by William Carlos Williams to be "a major poet with a sweep of understanding of the world, a feeling for other men that staggers me." His indispensable essays, "Projective Verse" and "Human Universe," and his study of Melville, Call Me Ishmael, remain as fresh today as when they were written. George F. Butterick was the editor of the complete Maximus Poems and author of A Guide to the Maximus Poems (California, 1978). He served as Curator of the Literary Archives at the University of Connecticut, which houses Charles Olson's papers.